Dogs, Cats, Sugar Gliders Care and Health. The Teacup Yorkie, a miniaturized version of the already quite small Yorkshire terrier, is a popular companion and a dog so cute that people will be stopping you wherever you go with your Yorkie in hand. Some people may argue that there is no such thing as a “teacup” Yorkie, and the American Kennel Club does not recognize a breed standard other than the basic Yorkshire terrier, but there are still plenty of aficionados who enjoy carrying their 2 or 3 pound bundle of Terrier dynamos. And since they actually can fit into a teacup, they are well-named! Personality-wise, these pups are a hefty package and they come with big barks. They are energetic, curious, smart and trainable – true to their terrier nature. Because of their size, they are excellent canine companions for those with small or cramped living spaces. They are affectionate and loyal, and with the proper degree of socialization plus a human owner who understands pack mentality, they are friendly to strangers. They also do well with a little bit of obedience training. Counter to their size, teacup Yorkies can have some rather large vet bills. While most live healthy, happy lives with little need for vet care other than the annual checkup and immunizations, some can have chronic conditions such as bronchitis, eye problems and tooth decay. Some do not tolerate anesthesia, which could be a problem if they require surgery. The breed has a high incidence of portosystemic shunt, a defect of the liver, which often requires surgery. A drop in blood sugar, known as hypoglycemia, is also found in a significant percentage of these tiny dogs. Of course, regular vet visits are a must, as they are with any breed of dog. But also because this breed is prone to hypoglycemia, having a thorough understanding of this condition is a must and your vet office can provide all the information you will need to keep your teacup Yorkie healthy. If your vet makes certain food and feeding time recommendations, follow them to the letter. 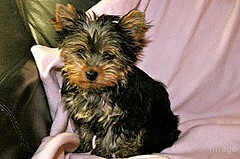 Super-small Yorkies may be more fragile because of their bone structure. And their tendons and ligaments are prone to injury more than their larger Yorkie counterparts. Because of this, households with small children may want to consider the larger version of this breed. Teacup Yorkies tend to be cold, and if your dog is really small, you need to be sure to keep him or her warm. You may feel completely comfortable at 68F degrees, but at that point your canine will be more comfortable in a sweater. The care of this dog is typical for the breed. The long, silky coat needs to be groomed, at least once a week, but preferably daily. This daily grooming routine provides excellent bonding opportunities between the human and canine companions. Also consider taking your dog to the groomer to get an easy-to-maintain hair cut. When it comes to sporting hair bows, no other dog breed can come close to the stylish teacup Yorkie. « Dog vomiting bile – what to do?